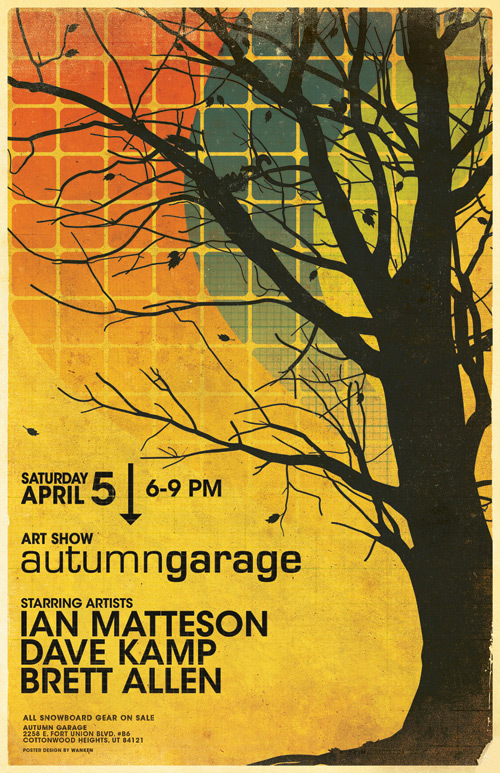 Autumn Garage Art Show | Shelby White - The blog of artist, visual designer and entrepreneur Shelby White. Early this week I took a trip to Portland, OR. I didn’t realize how much I enjoyed Portland until I came back today. Hopefully soon there will be another trip down there and I’ll take the camera with. I have been waiting a few days to blog a poster/flyer that I was asked to make for an Art Show at Autumn Garage in Salt Lake City. The show will feature work from Dave Kamp, Brett Allen and my good friend Ian Matteson. I will include the information below if you’re interested in attending the show. As of recent, I’ve been asked how many layers go into making a piece like this. My answer is simple—as many as it takes! Of course, the more layers, the larger the file size. For example, this file has around 90 layers being used. In return the file size is about 618MB—giant. Some of which were very small, but still served a purpose. 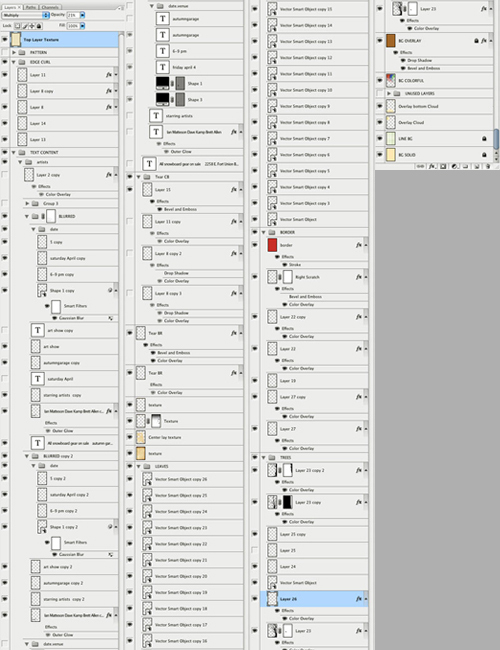 Here is a screen shot of the layers panel. Of course I’ve made the image smaller and moved it horizontal so you won’t have to scroll 6,000px down. It incredible sometimes how many layers you can create for even something that looks like a simple design. Notice you don’t rename all your layers which I think most designers are guilty of – be nice if there was a plugin or something to make layer naming easier it generally takes away from the designinig experience – must check out CS4 to see if that has any improvements. Its funny that you caught that. I’m a stickler for naming layers now. I make sure I color code as well as just naming. If you see the file at a much larger size you start to see all of the texture that was created.